Find hotel near Penfolds Magill Estate Wi ..
Australia’s finest wine, the Grange comes from this historic estate winery. 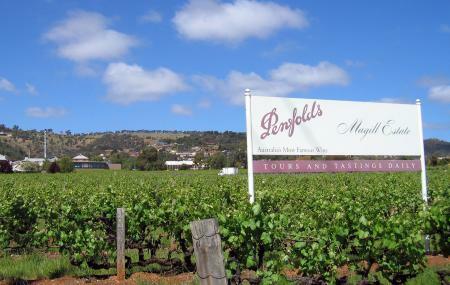 A short distance from Adelaide CBD, in the foothills is the Penfolds Magill Estate Winery. A must see visit for those who have an interest in Australian wines. The estate offers three enjoyable and informative tours. The Heritage Tour takes you on an hour-long visit through the estate and includes a guided tasting of 6 wines. The Super Premium tour offers a estate tour and a chance to taste five of Penfolds 'luxury' wines in a private cellar. The Great Grange Tour, a 2-hour estate of the tour and guided tasting 6 luxury-wines, includes a tasting of the Grange and a platter of gourmet cheeses. There is also a world-class restaurant on the estate that has received great reviews and offers excellent quality food and wine. Try and visit during Feb–June, when the vintage cellar is in full production. Heritage Tours are conducted from 11 am to 3 pm daily. How popular is Penfolds Magill Estate Winery? People normally club together Carrick Hill and Sugar Club while planning their visit to Penfolds Magill Estate Winery. This place was spectacular! We had a private corporate function/dinner here, and it was such a memorable experience. We did the tour down into the tunnel system and got the history spill on it all, it was just such an interesting event. Our guide was a very knowledgeable and enthusiastic young chap, that really added to the whole experience. Went inside and wait at the sign which said wait to be seated, 3 staffs stand 5 meters away from me, talking to each other, one of them I think is the waitress, another one is bar tender, the man next to him should be the manager. After I look at them for one minute, the waitress come to me. I asked her whether I can seat outside. She said yes and asked whether I just need a cup of coffee. I said yes. Then I waited at outside for 15 minutes. Still no one tried to server me. Then a waiter went outside with the manager. I told the waiter what I want. And this is the end. Very disappointed, I won’t come to this restaurant unless I do not have a choice in the future. Would give 10 stars if possible!! Sam was an excellent, informative, friendly tour guide. Fantastic value including the wine tasting. Highly recommended. Thank you Sam. Premier wine of Australia. This place is really worth a visit. The Heritage tour is really worth doing. They explain the history of the winery and take you through the now-converted cellars for a very memorable experience. You end your tour with a wine tasting which is the star of the show. I recommend visiting here.